For everything, absolutely everything, above and below, visible and invisible… everything got started in Him and finds its purpose in Him. Jesus taught: "as you help the least of these you are helping me." 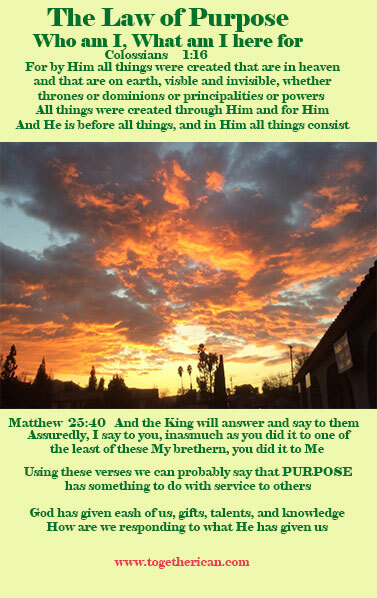 Referring to these verses we can probably say "purpose" has something to do with service to others. A question: is what you are doing providing a service to others? Does what you do help Gods children? Is your service "God aligned?" Is your service to others in alignment with God's thinking, or in opposition to his thinking? Do you utilize the gifts, the talents he has given you? Does your service further Gods realm? Are you building his kingdom with your service or are you building your own kingdom? Is what you're doing tearing down or destroying God's kingdom? That which is not nourished – withers and dies! Habits, whether good or bad, need to be reinforced, practiced in order to thrive. It takes discipline to continue or discontinue a habit. True spirituality – knowing the true God, accepting his Love, so you can give it away in fellowship. He that believe is on the Son, hath everlasting life. Whoever shall call on the name of the Lord shall be saved. Everyone has X and Y chromosomes in the body. Does having one or the other make you both a man or a woman? God is omnipresent, therefore he is in every cell of your body. Just because he's in you, a part of you, does that make you God? Why is it okay for man to judge God, but, it's not okay for the Creator of man, God to judge his creation? Did God create evil or did he allow evil, there is a difference. God created Lucifer the angel of light. Using free will, Lucifer challenged God for his position. God Cast Lucifer out and he is now called Satan. God created Lucifer (knowing what he would become). Lucifer became the being, the spirit, Satan. You get to believe and think, what do you want to believe and think. I encourage you to use discernment in all things. Keep an open mind, challenge your beliefs on a regular basis. Evaluate and determine whether your beliefs are empowering or disabling. Make it your goal to eliminate any and all disabling beliefs. If the belief leads to the unforgiveness of others, it could be considered disabling. In my estimation, to not believe in God, is a disabling belief. Look around you and see the beauty in nature, in the universe, that was created. Did it just happen or was there a Creator? The intricacies of the human body leads me to believe that there was a Creator behind the scenes. I came to my conclusion after 22 years of fighting an obsession with alcohol, using self-will and willpower, which never worked. I asked God to remove my obsession and from that moment on my obsession has been lifted. In that moment, I stopped trusting in myself and started trusting in something greater than myself. For the last 31 years it has continued to work.